Petty Officer Second Class Marc Lee, U.S. Navy SEAL, wrote this letter home just after the Independence Day holiday in 2006, demonstrating a wisdom and maturity beyond his 28 years. One month later, Marc became the first Navy SEAL to die in Iraq. Marc Lee was posthumously awarded the Silver Star for his actions that day. We ask you to pause for a moment to honor his sacrifice, and that of countless others like him, and their families, as we celebrate our freedom on this 4th of July Independence Day holiday. Glory is something that some men chase and others find themselves stumbling upon, not expecting it to find them. Either way, it is a noble gesture that one finds bestowed upon them. My question is, when does glory fade away and become a wrongful crusade, or an unjustified means which consumes one completely? I have seen death, the sorrow that encompasses your entire being as a man breathes his last. I can only pray and hope that none of you will ever have to experience some of these things I have seen and felt here. Most of what I have seen here I will never really mention or speak of, only due to the nature of those involved. I have seen a man give his food to a hungry child and family. Today I saw a hospital that most of us would refuse to receive treatment from. The filth and smell would allow most of us to not be able to stand to enter, let alone get medicine from. However, you will be relieved to know that coalition forces have started to provide security for and supply medicine and equipment to help aid in the cause. I have seen amazing things happen here; however I have seen the sad part of war, too. I have seen the morals of a man who cares nothing of human life. . . . I have seen hate towards a nation’s people who has never committed a wrong, except being born of a third world, ill-educated and ignorant to western civilization. It is not everybody who feels this way, only a select few, but it brings questions to mind. Is it ok for one to consider themselves superior to another race? Surprisingly, we are not a stranger to this sort of attitude. Meaning that in our own country, we discriminate against someone for what nationality they are, their education level, their social status. We distinguish our role models as multi-million-dollar sports heroes or talented actors and actresses who complain about not getting millions of dollars more than they are currently getting paid. Our country is a great country, don’t get me wrong on this, otherwise none of us would be living there. My point of this is how can we come over here and help a less than fortunate country without holding contempt or hate towards them, if we can’t do it in our country. I try to do my part over here, but the truth is over there, in the United States, I do nothing but take. Ask yourself, when was the last time you donated clothes that you hadn’t worn out. When was the last time you paid for a random stranger’s cup of coffee, meal or maybe even a tank of gas? When was the last time you helped a person with the groceries into or out of their car? Think to yourself and wonder what it would feel like if when the bill for the meal came and you were told it was already paid for. More random acts of kindness like this would change our country and our reputation as a country. It is not unknown to most of us that the rest of the world looks at us with doubt towards our humanity and morals. I am not here to preach or to say "look at me," because I am just as much at fault as the next person. I find that being here makes me realize the great country we have and the obligation we have to keep it that way. The 4th has just come and gone and I received many e-mails thanking me for helping keep America great and free. I take no credit for the career path I have chosen; I can only give it to those of you who are reading this, because each one of you has contributed to me and who I am. So to all my family and friends, do me a favor and pass on the kindness, the love, the precious gift of human life to each other so that when your children come into contact with a great conflict like that we are now faced with here in Iraq, that they are people of humanity, of pure motives, of compassion. P.S. Half-way through the deployment -- can’t wait to see all of your faces. Let us never forget that it is because of the dedication, honor and sacrifice of men and women like Marc Lee that we have the freedom to live the lives we choose, and to speak our minds without fear of government reprisal. I have had the great honor of getting to know Marc's mom, Debbie Lee, who chose to become Marc's voice and continue spreading his message that our troops believe in their mission and believe that what they're doing is helping to make our world a better place. I first learned of Marc's letter when Debbie read it to a meeting of representatives from several troop-support organizations, and I have to admit, I had tears streaming down my face long before Debbie's voice broke, on the P.S. Marc's first sentence is especially poignant now. We are grateful that Debbie granted us permission to share Marc's letter with you. Thank you, Marc Lee, and thank you, Debbie. You also have given the ultimate sacrifice. A parent can be asked no greater sacrifice than to give up a child. We admire you for the grace and dignity with which you honor Marc's service, and your dedication to thanking those currently serving. 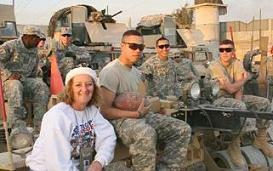 Debbie Lee traveled to Iraq over the Christmas holidays to personally express her gratitude (and yours) to our men and women in uniform. She donned body armor and a kevlar helmet to walk the streets where Marc took his last steps. What a remarkable woman. Any wonder where Marc Lee got his courage? Debbie reminds us that Marc's name means "Mighty Warrior." I'd say he lived up to his name, wouldn't you? Take a moment to watch and listen to Debbie's beautiful Memorial Day tribute to her son. And thank you to each and every member of our armed forces, all of whom contribute to our freedom. We hold you in our thoughts and pray for your safe return to your families. 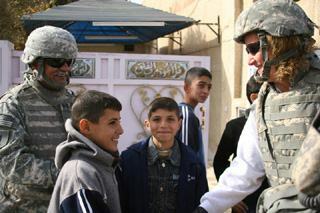 Thank you for your service, and for the support of and sacrifice made by your families that enables you to serve. As we celebrate our freedom this 4th of July Independence Day, we remember and appreciate your service. Gold Star Mom Debbie Lee traveled to Iraq to walk in her son's final footsteps. Debbie takes up Marc's challenge in his last letter home through her non-profit organization, America's Mighty Warriors. Please donate to support her efforts to provide care and comfort for other Gold Star families. In March 2013, The AO2 (SEAL) Marc A. Lee Training Center at Naval Special Warfare Group (NSWG) 1's headquarters aboard Naval Amphibious Base, Coronado, California, was officially named after Aviation Ordnanceman Second Class (SEAL) Marc A. Lee. Lee was mortally wounded during combat operations August 2, 2006, becoming the first Navy SEAL to be killed in Iraq in support of Operation Iraqi Freedom. NSWG-1 Commanding Officer, Capt. Collin P. Green, spoke about Lee's character and the significance of this dedication. "Naming the TRADET building after Marc is the ultimate honor and tribute to a SEAL," said Green. "It reflects the respect and high regard his leadership, his teammates and the community had for him, the high standards of excellence he represented as a SEAL, and more importantly as a person." Debbie Lee, mother of Marc Lee, addressed the crowd of more than 200 special warfare operators and honored guests. "A mighty warrior doesn't just happen; it takes much preparation and training: physically, mentally and spiritually - all of which Marc had made concentrated efforts in his life - so it is fitting that this building is being dedicated to Marc," said Lee. "His life will continue to challenge, motivate and inspire the warriors that train in this facility to pursue excellence and change the world, just as Marc did." Lee was posthumously awarded the Silver Star Medal for his brave actions in the line of fire. During an assault, his team came under heavy enemy fire. To protect the lives of his teammates, and to allow the medical evacuation of a severely wounded teammate, he exposed himself to direct fire by engaging the enemy with his machine gun and was mortally wounded in the engagement. "Greater Love Hath No Man Than This: That a Man Lay Down His Life For His Friends." John 15-13.